The 3000 amazingly shaped limestone islands on 1553 sq km blue sea water of Halong Bay create the unique painting of natural beauty. Many of these islands are surrounded by private white sandy beaches. To see the beautiful nature painting and get to these beaches, we have to use Halong bay cruises. 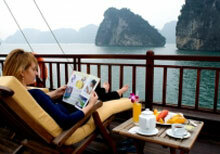 Book Halong beach vacations with us to discover the luxury comfort of Halong Bay cruies and beautiful beaches. 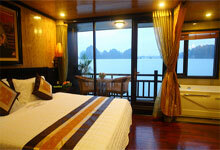 Trip name: Halong beach vacations. Add unique experience on amazing scenery of the bay and the luxury comfort of Halong bay cruises - the king of beach tourism in Vietnam, luxury all inclusive. If not fully satisfied with the trip, you will have money back. Limited offers.